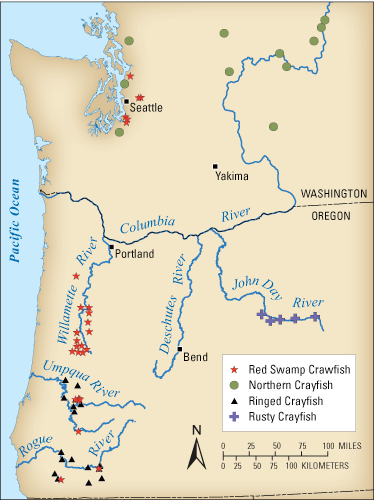 Distribution of four invasive crayfish in Oregon and Washington. Data are from USGS surveys in western Oregon and from Larson and Olden (2011) in Washington and John Day River, Oregon. Invasive species directly threaten freshwater biodiversity, particularly in regions of high aquatic richness like the Pacific Northwest (PNW). Crayfish are among the most impactful of aquatic invasive species. Invasive crayfish are considered ecosystem engineers due to their ability to alter basic wetland properties, such as reducing vegetation and bank integrity and increasing turbidity. 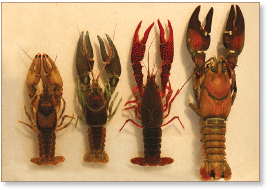 In areas where invasion is advanced, crayfish pose major economic and ecological problems. 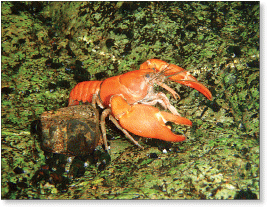 Crayfish have been widely introduced for aquaculture and can become established in a wide range of habitat conditions. They also may be spread by anglers who use them as bait. Several non-native crayfish are established in the PNW, but the extent of their invasion is not well known. At least two groups are known from scattered sites in the PNW, and both have proven problematic for native species in other parts of the world: Red swamp crayfish (Procambarus clarkii) and several members of the genus Orconectes. Both groups are native to areas of the eastern United States. Both are identified globally as invasives of high concern and appear on the Oregon Department of Fish and Wildlife’s “10 Most Unwanted” and the U.S. Forest Service’s “Primary Species of Concern” lists for stream systems in the PNW. Despite the presence of introduced crayfish in the PNW and their high potential for negative effects, the scope of their invasion and effects on aquatic systems are not well known. The U.S. Geological Survey (USGS), along with local groups and state agencies, is working to clarify crayfish distribution and to outline which basins may not yet be invaded. Other goals are to improve understanding of habitat associations of invasive crayfish and their potential effects on native crayfish. Signal Crayfish. Photograph by R. Hinderer. 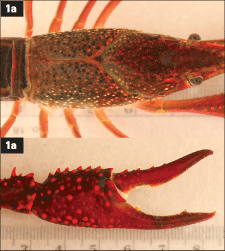 This key includes the major crayfish species from western Oregon and Washington. Signal crayfish (Pacifastacus leniusculus) are native to this region, and genetic work is ongoing to understand their taxonomy. Two other species (P. connectens, P. gambelii) are native to the interior PNW and are not described here. 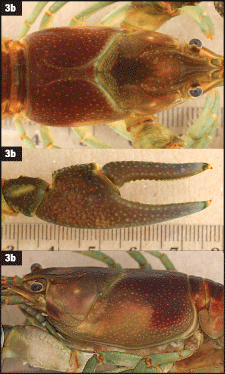 The descriptions and the photographs to the right identify distinguishing characteristics of Carapace/Areola (upper photograph) and Chelae (lower photograph). Carapace refers to the main body cavity of the animal; aerola is the space between lateral plates on the center back of the carapace; chelae are the main pinchers on the front pair of walking legs; tubercles are round or thorn-like bumps often seen on chelae. Ruler in photographs shows centimeters and millimeters for scale. 1a. Narrow areola or lateral plates touching; body color generally reddish overall; surface of carapace often rough or grainy, especially on larger individuals (>25 mm carapace length); chelae slender and elongated with rounded tubercles on broad surface and sharper tubercles on the narrow surface. Introduced to Pacific Northwest, native to southeastern United States. 1b. Moderate or wide areola; surface of carapace generally smooth; chelae on adults are thickened or robust; chelae with generally smooth surface and few or no pronounced spines. 2a. Chelae moderately to very robust and relatively uniform in color above; chelae of adults often red below and with whitish spot at joint of fixed and moveable pincher; chelae without colored tips; no contrasting bands on side of carapace. Native to Pacific Northwest. 2b. Chelae with black bands or colored tips at ends of fixed and moveable pinchers; chelae may have rounded tubercles on margins; sides of carapace often have stripe or blotch in adults. 3a. Chelae tips have wide, distinct black bands with orange terminus; chelae of adults often have small rounded tubercles mostly on margins; a wide gap often exists between fixed and moveable pinchers when they are closed; sides of carapace on larger individuals have contrasting light and dark diagonal bands. Introduced to Pacific Northwest; native to Ozark region and portions of Central Plains, United States. 3b. Chelae tips have narrow black bands and usually show small orange spot on terminus; chelae may have small rounded tubercles mostly on margins; a wide gap exists between pinchers when closed; sides on larger individuals have reddish/rusty blotch toward rear edge of carapace. Introduced to Pacific Northwest; native to southern Great Lakes region , United States. 3C. Chelae usually with orangish tips; black bands on tips vary from diffuse to lacking; chelae with distinct tubercles on margins, particularly inside margin; gap between closed pinchers is narrow or absent; sides of carapace often lack strongly contrasting bands or spots in adults, although banding may be visible in juveniles. Introduced to Pacific Northwest; native to central United States. Northern or Virile Crayfish, Orconectes virilis (no photographs). Gruendike, P., and Lanigan, S., 2008, Aquatic invasive species survey report 2007 field season: U.S. Forest Service report, 4 p., accessed September 28, 2011, at, http://www.reo.gov/monitoring/reports/watershed/InvasiveSpeciesAREMP2007.pdf. Hobbs, H.H., Jr., 1976, Crayfishes (Astacidae) of North and Middle America: U.S. Environmental Protection Agency Water Pollution Control Research Series 18050 ELDO5/72. 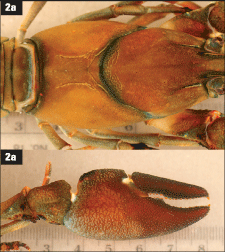 Larson, E.R., and Olden, J.D., 2011, The state of crayfish in the Pacific Northwest: Fisheries, v. 36, p. 60-73. Moore, J.W., 2006, Red Swamp crayfish (Procambarus clarkii), Rusty crayfish (Orconectes rusticus), Virile crayfish (Orconectes virilis), in Boersma, P.D., Reichard, S.H., and Van Buren, A.N., eds., Invasive species of the Pacific Northwest: Seattle, University of Washington Press, p. 100-101. Oregon Department of Fish and Wildlife, 2011, Oregon’s unwanted invasive species: Oregon Department of Fish and Wildlife, accessed September 28, 2011, at http://www.dfw.state.or.us/conservationstrategy/invasive_species/most_unwanted.asp. Pearl, C.A., Adams, M.J., Leuthold, N., Bury, R.B., 2005, Amphibian occurrence and aquatic invaders in changing landscape—Implications for wetland mitigation in the Willamette Valley, Oregon, USA: Wetlands, v. 26, p. 76-88. U.S. Geological Survey, 2009, Nonindigenous Aquatic Species (NAS): U.S. Geological Survey database, accessed September 28, 2011, at http://nas.er.usgs.gov/. This work was supported by the State Partnership Program, USGS Regional Office, Seattle, Washington, and USGS FRESC, Corvallis, Oregon. We thank the Oregon Department of Environmental Quality and the Oregon Department of Fish and Wildlife for assistance. Photographs taken by Brome McCreary unless otherwise noted. 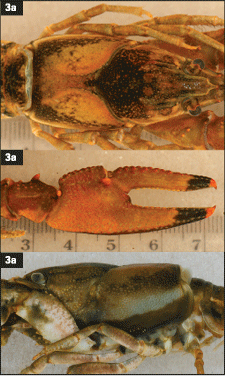 Pearl, Christopher, McCreary, Brome, and Adams, Michael, 2011, Invasive crayfish in the Pacific Northwest: U.S. Geological Survey Fact Sheet 2011-3132, 2 p.